A spring festival might just be the order of the day. If you're in the mood for cherry blossoms, there's a yearly Spring Flowers Festival on Yeouido Island, in Seoul, South Korea. This festival takes place in the Yeouido Hangang Riverside Park. Take a walk around the island under the shade of nearly 1600 cherry trees (prunus yedoensis). Yeouido is the home of the South Korean National Assembly. Traditional women drummers entertaining the crowd at the Yeouido Cherry Blossom Festival. 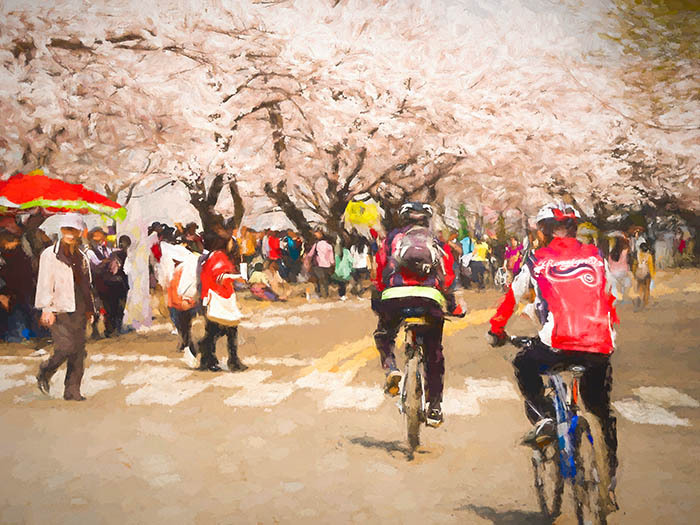 After a bone chilling winter -- yes, Korea has cold snowy winters -- bicycles and cherry blossom viewing replace snowboards almost overnight. Thousands of people will walk under the shade of the cherry blossoms during spring cherry blossom festival. 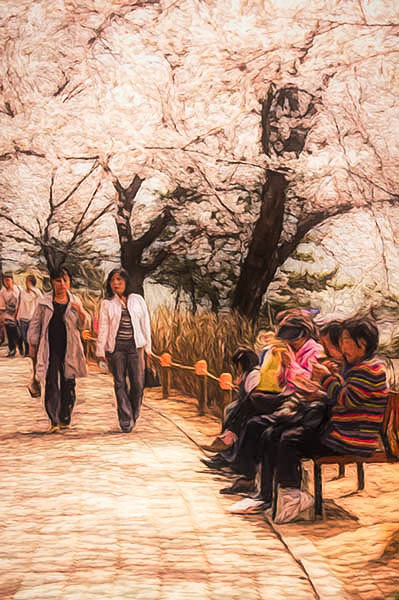 A painterly photo of the stroll around Yeouido's Spring Flowers Festival. If you're planning on visiting, it's always a good idea to have an idea of the area so you can plan your day. I didn't stay for the evening ceremonies, but if you do, you might want to brush up on your night photography skills! Not only for the spectacular fireworks show on the first night... the cherry trees are lit up every night and that makes for some exciting photos. There's a long somewhat circular walk around the government buildings. 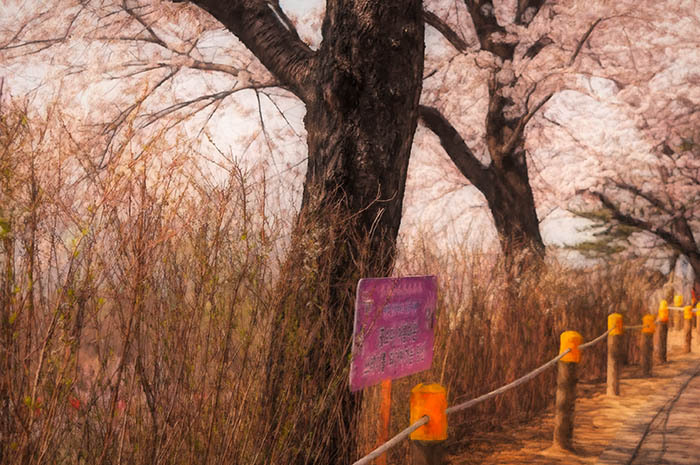 Once the cherry blossoms pop out, people flock to the area, not just from the Seoul area, but from all areas of South Korea and from all over the world. What settings I used for these photos: To get everything in focus I used f 11. That's my camera lens's sharpest focus... do you know what that is on your lens? It was a very warm and bright day, though it was very hazy and there were no dark shadows. That worked well since all my photos were taken in the middle of the day. Need a little guidance on exposing your photos properly? Help is here. People make your images more interesting so include them as often as you can. A curved walkway makes gives this image some perspective it's more intriguing than a straight path. There are no people right in the middle of the image. The groups are on each side of the picture... the people seated are on the lower third spot and the people walking straddle the left third line. Spring festival Yeouido South Korea. A popular route for cyclists and people walking under the cherry trees. A few years after I arrived in South Korea, bicycling as a sport became more and more popular. That was apparent here in Yeouido where bicycles were profuse. Cyclists had all the gear and, unfortunately, at the time, they all wore masks to filter out pollution. In the spring, we experienced not only the high levels of Korean pollution but China's horrible spring air blew in to make the air far worse. That's the yellow dust and it's nasty with dangerously high levels of heavy metals and such. I hope that with the work that China and Korea are doing to improve the air quality and environment that this will change. 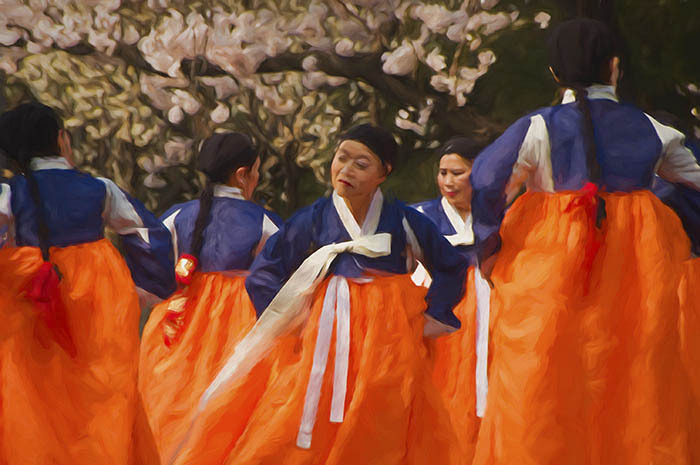 Korean South Korean traditional dancers celebrating the cherry blossoms, springtime, Yeouido. 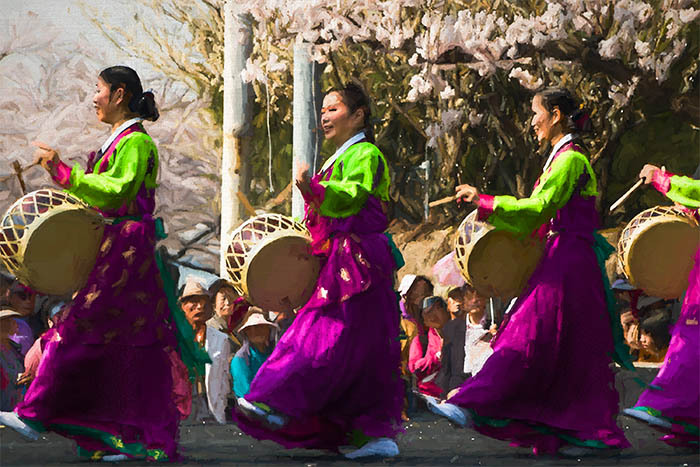 Korean springtime is short and sweet but there are plenty of spring festivals to keep you hopping. 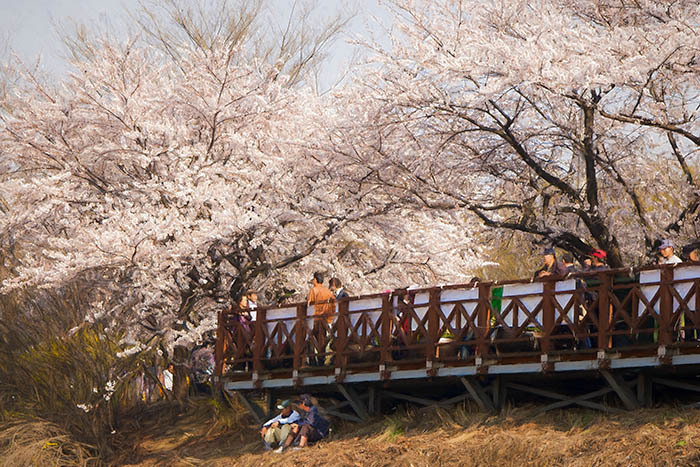 Plan well and you can pack several cherry blossom festivals into just one week. Cherry trees along the walk way around Yeouido, Seoul, South Korea. 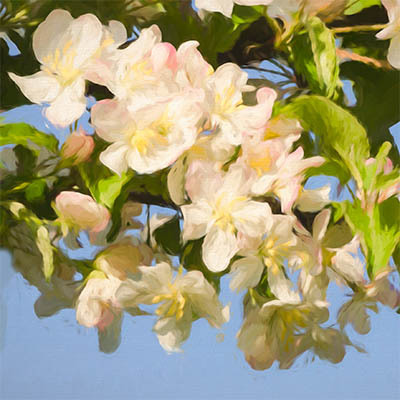 This image is edited to look more like a painting. I have no shame about artistically manipulating my photos. I don't listen to the purists and express what I feel and like... and you should, too. 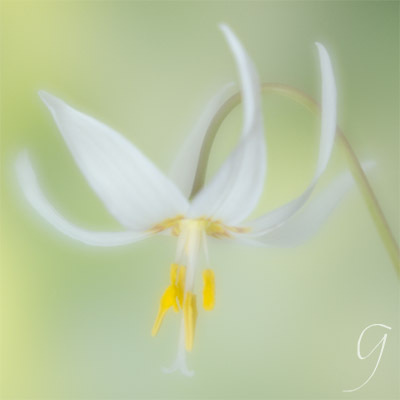 I use Photoshop and Lightroom and the Topaz Suite, mostly Impression. 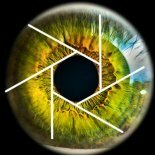 ON1 is another popular photo editor that just keeps getting better and better. The day I visited Yeouido, the haze was thick but with this painterly photo edit, it becomes more subtle. The cherry tree and blossoms are too pretty to hide behind pollution! You don't notice it in the image, do you? There's no added texture, which I sometimes add as a layer (or many) in Photoshop. None of the images on this page have any brush layers. Impression did the job of turning them into oil paintings. If you shoot in JPG, NEVER use the original because when you click SAVE, you lose your original file. All those pixels are gone forever. Time to go! Down the hill and back along the Han River to the subway... a quick look behind to take the last pictures of the cherry trees. My train was leaving Seoul in a few hours so this was the last opportunity to photograph the cherry blossoms this trip. Looking back to say good-bye to the cherry blossom walk around Yeouido. Korea - A small and friendly country with a wild passion for flowers and gardens... and a great spring festival in Yeouido! 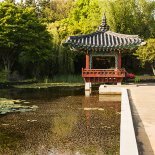 Its hustle and bustle capital city, Seoul, is a great destination for cherry blossoms and spring flower festivals. Check out all the great reviews on Trip Advisor here, then make your plans. Psst.... don't forget to pack your camera.